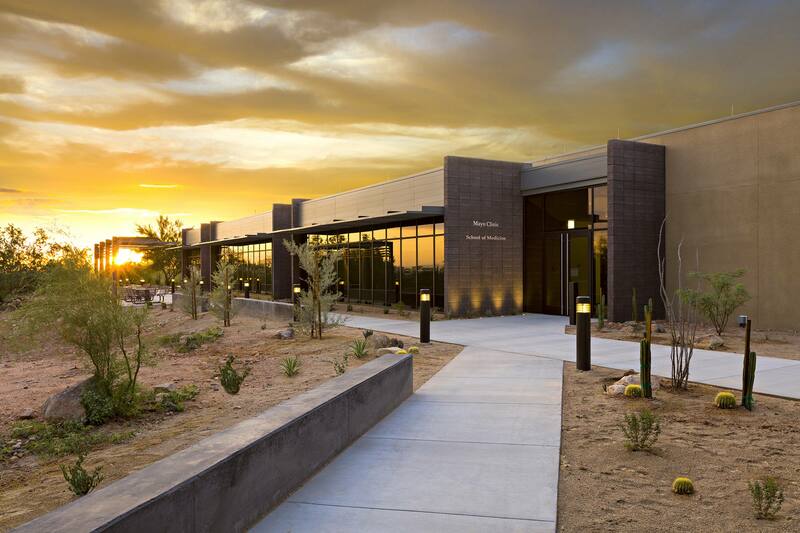 SCOTTSDALE, Ariz. — Mayo Clinic has received a $25 million gift from William A. and Carolyn D. Franke and family from Paradise Valley, Arizona. This transformative gift will support scholarships and operations, such as faculty development and curriculum innovation at Mayo Clinic School of Medicine – Arizona Campus. It is the largest contribution in the history of Mayo Clinic’s Arizona campus. Mr. William (Bill) Franke, one of Arizona’s most prominent business leaders, and his family long have been interested in education and its impact on the Arizona economy. The Franke family was drawn to Mayo Clinic School of Medicine’s commitment to educating diverse learners. This gift will guarantee scholarships are available to recruit the best and brightest students who choose their career based on passion rather than financial concerns or social background. “We must redefine medical education and advance innovative medical education models if we are to meet the needs of patients and society in the 21st century,” says Fredric Meyer, M.D., executive dean of education, Mayo Clinic. “This gift holds great power to allow Mayo Clinic School of Medicine to advance this journey, allowing the school to continuously valuate and re-engineer the curriculum to provide the best educational programs and learning paradigms available in the world.” Dr. Meyer is the Juanita Kious Waugh Executive Dean for Education. Physicians need more than traditional medical skills to succeed in the hospitals of tomorrow. The most promising students are looking for a more rigorous academic experience that incorporates advanced technology and opportunities for supplementary training. Mayo Clinic School of Medicine is transforming medical education and research training to improve patient care, accelerate discovery and innovation, and advance the practice of medicine. Through a curriculum dedicated to lifelong education, students at Mayo Clinic School of Medicine learn from world-class faculty to exchange ideas and challenge traditional science with a never-ending quest for new knowledge. This philosophy has garnered the medical school the No. 6 ranking in U.S. News & World Report’s Best Medical Schools. The medical school is the flagship school of Mayo Clinic College of Medicine and Science, one of the largest postgraduate medical education system in North America. The college educates more than 4,000 students annually in four schools. In addition, Mayo Clinic School of Continuous Professional Development educates 100,000 learners annually. Mr. Franke is the managing partner of Indigo Partners LLC, a private equity firm focused on investments in air transportation. During Mr. Franke’s business career, he has been the CEO of a Fortune 500 forest products company, chairman of the Executive Committee of the Valley National Bank, now part of Chase Bank, chairman of the Circle K Corp, a large U.S. convenience store company, and CEO of America West Airlines (now part of American Airlines). Mr. Franke is an airline pioneer who is considered by industry experts as the man most responsible for the creation of the ultra-low-cost carrier in the U.S.
Mr. Franke served as the founding chairman of Airplanes Group Ltd., a $5 billion aircraft finance vehicle created from the aircraft portfolio of GPA Group plc., the Irish aircraft leasing company, and supported by GE Capital Aviation Services. He was involved in the 1998 acquisition of GPA (then renamed AerFi Group) by Texas Pacific Group, Inc. and served on AerFi Group's board of directors until it was sold in 2000 to Debis AirFinance. Also, along with an investment group led by David Bonderman, Mr. Franke was an investor in Ryanair DAC before its initial public offering. Mr. Franke was the founding chairman of Tiger Airways Singapore Pte Ltd.; served as chairman of Spirit Airlines Inc. (U.S.); serves as chairman of Frontier Airlines (U.S.), JetSmart Airlines (Chile),and Wizz Air Hungary Ltd., and is a director of Volaris (Mexico); and has served, and currently serves, on several public company boards of directors. Mr. Franke was born in Texas, raised in Latin America and graduated from high school in Brazil. He has undergraduate and graduate degrees from Stanford University, and was awarded an honorary doctorate degree from Northern Arizona University. The Frankes' son, David, and his wife, Stephanie, are members of Mayo Clinic’s Arizona Committee of the Leadership Council. These philanthropic ambassadors help forge meaningful and active partnerships with individuals committed to Mayo Clinic’s values, mission, vision and campaign funding priorities. Originally established in Rochester, Minnesota, in 1972, Mayo Clinic School of Medicine is ranked among the top 10 medical schools in the nation by U.S. News & World Report. A national medical school with campuses in Arizona, Florida and Minnesota, it is considered one of the most highly competitive medical schools in the country for admittance. The expansion to a national medical school gives the school the ability to deliver extraordinary medical education and highly diverse clinical experiences to students across all Mayo campuses.